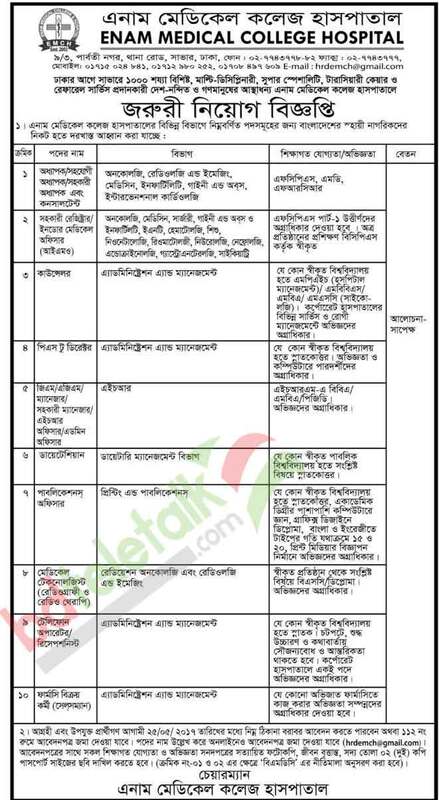 Enam Medical College Hospital job circular 2017 has publish on 23 April ar Prothom Alo newspaper. They will recruit some personnel for the hospital. Original Bangladeshi candidates can apply for those following post. Bellow you have to see the details and application process of Enam Medical College Hospital job 2017. More details you may find on www emcbd com. Job Title: Professor/ Associate Professor/ Assistant Professor and Consultant. Department: Oncology, Radiology and Emerging, Medicine, Infertility, Gyne and Obs, Interventionist Cardiology. Job Title: Assistant Register/ Indoor Medical Officer (IMO). Education Qualification: HRM BBA/ MBA. PGD and experienced are preferable. Job Title: Dietician, Publications Officer, Medical Technologist (Radiography and Radio Therapy), Telephone Operator/ Protectionist, Pharmacy Salesman. Interested and eligible candidates must apply by 25 May 2017 to the following address which is mention on advertisement. Also you may submit your applications directly to Room No. 112. Besides you may send your application form by email at [email protected] along educational certificates photocopy, CV, two copies photo. More details check the advertisement and Enam Medical College Hospital official website at www emch.com. [email protected] com. enam medical college job circular.